Collin over at Hip to Save recently had a great post on gift basket ideas made with all your coupon goodies. Check out all her readers great ideas here. 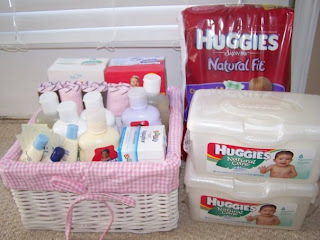 That reminded me to share my gift basket for a baby shower that I made with all my coupon goodies. I gave her the basket with all the baby stuff and then put the diapers and wipes in a separate bag. Regular price I would have paid $41.69! That even includes the basket being 50% off, the washclothes 40% off, and the Huggies bath stuff b1g1 free. If I would have paid full price for all of it it would have cost me $66.38!! I have enough of this to give many more gift baskets and have since been on the hunt at Goodwill and yardsales for inexpensive baskets to reduce my cost even more. My brain is already spinning with more gift basket ideas I could do for Christmas, holidays, college kids, etc. What about you? Any gift basket ideas that you have done or plan to do with your coupons goodies? I love this idea! Last year I gave all the ladies on my Cmas gift list a reusable bag I had gotten free full of soap, toothpaste and hair stuff. This year I plan to fill a basket or another specialty bag with laundry stuff (bounce bar etc). I just did this kind of thing for a friend who bought a house. I had extra cleaning and household products and made a cute basket out of stuff in my stash! Thanks to you and other bloggers who help me find the deals! Thanks for the tip. I have given you the Lovely Blog Award. Thanks for sharing your many deals. We have a friend getting married this weekend and I'm taking a cleaning bucket full of cleaning supplies as the gift. I got the bucket at Bed Bath & Beyond (using a cpn, of course) and all the goodies inside were super cheap or free w/ cpns. Last Christmas, I gave my babysitters gift bags full of free hair things, lipgloss, mascara, nail polish, candy, gum, etc. I gave "off to college" totes to the girls I teach at church. They were all moving out for school so I found plastic shower totes on 75% off at Bed Bath and Beyond and filled them with all my freebies from Walgreens and CVS (shampoo, conditioner, lotion, razors, shave gel, chapstick, toothpaste, a toothbrush, soap, etc....all the stuff that it's painful to pay for when you are a student. I wrapped them in clear celophane and they looked cute. I'd attach a photo but I don't think I can! The girls loved them! Looking for a Spa Gift Basket - all natural bath and body products- you might find a unique gift basket at Castle Bath Spa Products!